Surfboards, wetsuits and mountain bikes can be rented and being brought additional to all accommodation. Ask for prices by requesting for the accommodation. The holiday house Casa Tucano is a spacious cozy two bedroom villa with a south-west facing secluded garden and 8m x 4m private pool. The villa is located in a quiet corner of the urbanization 4-6 km away from the breathtaking beaches of Arrifana, Monte Clerigo and Amoreira and 10 km away from historical town of Aljezur. Around the area you can find the beautiful hiking trails located in the heart of Vicentina Coast Natural Park, certified as "Leading Quality Trails - Best of Europe". There are three restaurants and a mini-market with fresh products just a km away. Casa Tucano offers a fully equipped kitchen, ready for heavy or light cooking; it contains a fridge, electric oven, gas stove, dish washer, toaster, sandwich maker, coffee machine, juicer, pots, dishes and all utensils. There is a laundry/deposit room with window next to the kitchen where you can store your goods. The spacious and cozy living room is equipped with an enclosed double glazing wood burner, 2 sofas, a dining area and all modern technology including Wifi, Smart Tv w/ Satellite. The living room opens out into a closed-in/adjustable sun room. A south facing door allows you to walk out from the sun room through a grape tree covered terrace onto the pool deck. There is a great view from the all-day sun facing pool overseeing the valley. On the pool deck there is a solar powered outdoor shower and a built-in BBQ with a sink and marble top where you can do your outdoor cooking. There are two bedrooms; one king sized bed en-suite full bathroom; the second one offers twin beds. There is a second fully equipped bathroom conveniently situated on the hallway right next to the bedroom. The activities such as surfing, paddle boarding, kayaking, horse-riding, biking and hiking will allow you to complement a complete vacation package. The rental prices of the holiday house are valid for a minimum stay of 7 nights, rental period (1) for 2 rental period (2) for 4 persons. Every more person + 10 € per night in rental period (2) and 25 euros per week in rental period (1). For final cleaning there is an extra charge from 80 € . Refundable security deposit: 200,- €, Bedding and towels are supplied. Arrifana: Small fishing and holiday village, various cafés and restaurants. Situated directly at the beach of Arrifana and a small fishing harbour. There are 2 urbanizations near by. Objects of interest Ruins(17th c.). 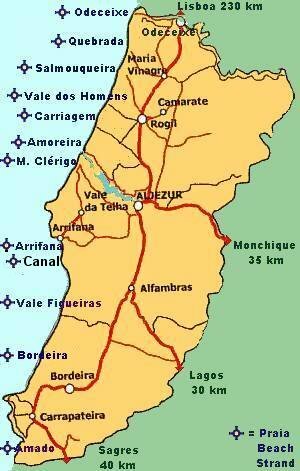 Approximate distance to the village of Aljezur is 8 km. The urbanization is situated between the beaches of Monte Clérigo, Arrifana and the village of Aljezur. Approximate distance to the beaches Arrifana, M.Clérigo is 4 km, Amoreira 5 km and to the village of Aljezur 6 km. Objects of interest: Archeologically excavations at Ponto de Alalaia. Surf, bodyboard, tours by bike, foot, horse or boot, Kayak tours, tenis, yoga and much more.